Arthritis, Joint Replacement & PT. More than a spa treatment: Why massage therapy is part of what we do. Science has proven massage therapy has a long list of benefits. In conjunction with other physcial & occupational therapy methods, massage therapy can drastically speed results. Supplementing your traditional therapy with massage therapy sessions can improve your overall therapy experience and emotional well-being during the healing process. Most importantly, you have control over the experience! Talk to your therapist and discuss level of pressure, areas of discomfort or pain, and symptoms and they will customize your session specifically for your needs! Don't wait another minute! After reading up on Astym on our "Special Treatment" page, you may still wonder why Astym treatment is so much better than just using traditional therapy methods: www.astym.com is a wonderful resource to learn more. If you or anyone you know have experienced any of these conditions, call us! One of our ceritified ASTYM clinicians will be happy to consult with you about how our treatment could be right for you! Years ago, repetitive strain injuries were thought to only be a problem for factory or assembly line workers as a result of doing exactly the same tasks over and over. 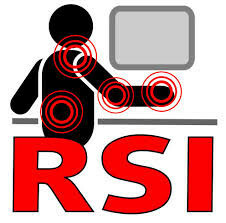 However, recent research suggests that any activity, recreational or occupational, that uses the same muscles or muscle groups to complete a variety of tasks within a short period can be a cause for RSI's. Love to play tennis? Tennis Elbow (also known at Lateral Epicondylitis) is a common tendinitis condition caused by overuse of the elbow. Have you been diagnosed with Carpal Tunnel? Carpal Tunnel Syndrome is the second most common condition linked to worker's compensation cases in the United States; second only to it's RSI cousin- back pain. In fact, one in every three workers' compensation dollars pays for RSIs. In all, insurers awarded an estimated 2.73 million workers' compensation claims for RSIs in one year, costing employers more than $20 billion. Indirect costs to employers are estimated to be five times that amount at $100 billion.(U.S. Department of Labor, OSHA Archive, https://www.osha.gov/pls/oshaweb/owadisp.show_document?p_table=SPEECHES&p_id=206). You do not have to be doing heavy labor to experience an RSI: a quarter of occupational RSI's recorded in the last 10 years are related to typing and computer work. What are the risk factors of Repetitive Strain Injury? Why are RSI's so significant? These muskuloskeletal disorders can be debilitating and cause long term damage to muscle, ligaments and tendons. Many of these diagnosis are treated with short term results from pain relievers, injections, and other topical applications. There is also a high percentage of injury recurrence with these treatments. More severe cases often result in surgery and a lot of downtime. How can we help? Therapy is the most effective way to treat RSI's. We help relieve pain, reduce inflammation, regain strength and mobility, and improve flexibility. We are also trained to educate patients on improving body mechanics, avoiding related stressors and improving ergonomics to prevent re-injury. Check out the OSHA training powerpoint to find out more about RSI's, related conditions, or occupational health and safety. Have you been injured at work and had to deal with the stress of filing a worker's compensation claim? Hundreds of thousands of workers experience injuries from occupation related events or occurrences every year. Thousands of work days are missed and millions of dollars spent. The statistics are staggering: http://www.bls.gov/news.release/pdf/osh2.pdf. There are so many hoops to jump through and details to pay attention to; it can be overwhelming. Often, one of the hardest decisions during a work comp injury case is knowing when you are ready to return to work. Luckily, we can help with that. A Functional Capacity Evaluation is one of many tools in our belt. Also knows as FCE, a Functional Capacity Evaluation is an intensive test that requires a patient to perform duties that are a replica of their actual occupation. The physical requirements of the patient's job description are assessed by a Doctor of Physical Therapy. Our DPT's create a series of physical tests that have to be completed over the course of consecutive hours. The patient's performance, physical capabilities and response are documented using the nationally recognized OccuPro system (Learn more about the importance of thorough documentation at www.occupro.net.) Occupro does not only test the patients capability to perform certain job demands (i.e. lifting, bending, standing, walking, etc. ), but also the level of stress the body experiences while performing those tasks (i.e. heart rate, endurance, blood pressure, etc.) The combination of detailed data is what makes our FCE's the most competent test on the market for return-to-work status. If you or someone you know has been injured at work, call us! We will be happy to discuss if an FCE could help you in your worker's compensation case.